A friend invited me to go and see Boy George in Chamonix last Friday night. Yes, that’s right – Boy George of the Culture Club fame, the iconic girlie-man in the pop band of the 1980’s – was in this wee village DJ’ing, or ‘spinning.’ When I remarked on how bizarre it was to have Boy George in town to my husband, he tried to give it the ‘big un’ about how Chamonix is a cosmopolitan place, a destination for many, and that I underestimate its appeal…that Boy George probably saw it as an opportunity to go snowboarding for the weekend, hang out in a “cool French Alpine village,” and do his DJ’ing. Hmmm. I later found out he was paid 15k, which makes more sense. Curious to see what he looks like now, and a little anxious to prove to myself that I’m not only a rapidly aging mother, I agreed to go. Then I found out that he wasn’t scheduled to begin till 1am. If I’m up at 1am these days it’s cause my little tyke has wet or pooped himself, had a ‘night terror,’ is hungry, or has indigestion. Moreover, if I’m up at 1am these days, it means that when my day inevitably begins at the crack of dawn, I’m going to be even more fatigued than usual. Not wanting to disappoint my friend, however, or myself, I decided that on the night of the show, I would go to bed at the same time as my son (shortly after dinner), then wake up at midnight and go to the gig. All went as planned, I got a few hours of sleep, got dressed, made a coffee for myself, took an ibuprofen, (god I’m lame), and set off for the nightclub. Nightclubs still smell like the teen spirit of my youth – sweat, alcohol, hormones, and the close, stale smell of an interior that never opens its doors for a spring-cleaning. This one is downstairs in a cave-like space below a two-story magazin. I couldn’t help but think that if there were a fire none of we club goers would be able to escape and it’d be a tragedy noted on the AOL homepage. Many of Chamonix’s expat ‘society’ were out for the gig – middle aged, middle class, dressed up in heels and ‘hip’ tennis shoes, already drunk in celebration of being away from their respective hearths-and-homes, in denial of the next morning and the demands of children and the household. Boy George didn’t come on until 3am (he must have been snoozing before his set, too) and he looked good: he had a sequined butterfly flower makeup design on half of his face, eyeliner, white foundation make up, and a pink, glittery fedora, with a simple black suit. Like the rest of us, he’s put on a bit of weight over the years. There was a charisma and energy around him – you could sense him moving through the crowd even before he entered the DJ booth. Immediately there was a tight knot of people around the little booth, which would have made me claustrophobic. Hyper-realistically, cell phones were over the heads of everyone standing around him as they took pictures and made videos. 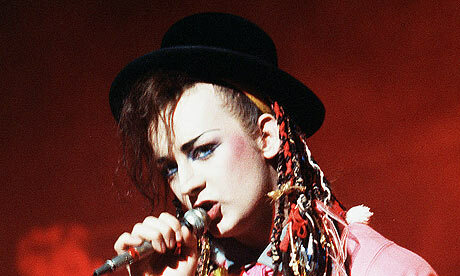 Boy George didn’t do much other than bob around while his partner actually DJ’d, then he, himself, started spinning. He chose ‘poppy’ riffs, which were good, and the music he chose had an energetic, non-aggressive beat, but after awhile, it was repetitious, and, well, boring. I wasn’t the only one to think so either ‘cause the club drained of folks pretty quickly. That said, maybe the crowd left because they were knackered in the small hours of dawn?